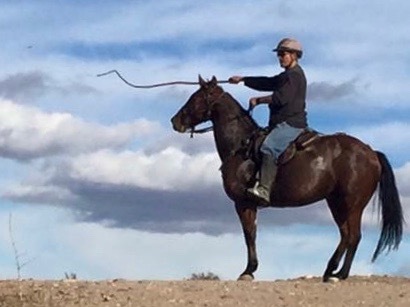 Anthony De Longis — Colin Dangaard, Inc.
Anthony De Longis endorses Colin Dangaard's Australian tack and exclusively uses it at his training facility in Canyon Country, California. A top notch documentary providing an insider's look into the life of sword fighting legend, Anthony De Longis. It explores not just his martial prowess, but also takes a peek into the man behind the sword. When staying in the saddle matters, Anthony De Longis rides in Colin Dangaard Aussie Saddles !!! 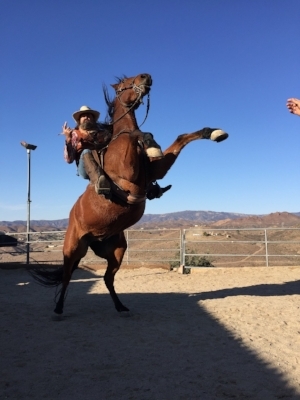 Or teaching Hollywood stars to feel comfortable enough in the saddle to ride like the wind !!! ANTHONY DE LONGIS : ACTOR, DIRECTOR, FIGHT COORDINATOR, WEAPONS EXPERT, VOICE OVER ARTIST, AUTHOR. Anthony has worked in virtually every aspect of the entertainment industry for over 44 years and counting. Professional credits span Film, Television, Theatre, Motion Capture, Voice Over and Opera. He's performed with some of biggest names in the entertainment industry, including Tom Cruise, Harrison Ford, Jet Li, Ron Howard, Yuen Woo Ping, Tim Burton, Michelle Pfeiffer, David Carradine, Patrick Swayze, Angelica Huston, Placido Domingo, Brendan Frasier and Charlton Heston, to name a few. As an Actor (ACTING RESUME), De Longis portrayed Shakespeare's immortal villain Iago in OTHELLO, twice, and co-starred in the popular movies FEARLESS, ROAD HOUSE, MASTERS OF THE UNIVERSE, CIRCLE OF IRON, JAGUAR LIVES, BOOMERANG (best Actor AOF 2107) and THE SWORD AND THE SORCERER. He created the role of Kazon leader Maje Culluh for STAR TREK: VOYAGER, guest starring in five of the series' episodes. Television appearances include REVOLUTION, GRIMM, MYTH BUSTERS, LEVERAGE, ER, THE OUTER LIMITS, QUEEN OF SWORDS, THE ADVENTURES OF SINBAD, CONAN THE ADVENTURER and BABYLON 5. On HIGHLANDER: THE SERIES, he guest starred as Immortals Lyman Kurlow and Ottavio Consonne, co-choreographing his sword action with friend and fellow Swordmaster F. Braun McAsh. Voice Over credits include starring as Sheriff Leigh Marshal in Rock Star Games' RED DEAD REDEMPTION and General Serrano in BULLETSTORM. As a Fight Director and choreographer, he's known for his skill and knowledge in a broad range of bladed weapons arts, always building his action from combative truth to tell a more dynamic action story. De Longis introduced the unique style of Spanish rapier fighting to the screen in HIGHLANDER: the SERIES and created a more efficient, effective and visual style of whip work for Michelle Pfeiffer's "Catwoman" and Harrison Ford's "Indiana Jones" in CRYSTAL SKULL. He's demonstrated his practical skills with blade, whip, gun and horse on History Channel's MORE EXTREME MARKSMEN, MYTH BUSTERS, LOCK & LOAD, TRIGGERS, 101 WEAPONS THAT CHANGED THE WORLD and DEADLIEST WARRIOR. View his Fight Director / Action reel and Stunt resume at His ACTION page. He is a member of SAG, AFTRA, AEA, ACTRA, AMPAS, ATAS, the Black Belt Hall of Fame, USA Martial Arts Hall of Fame, International Knife Throwers Hall of Fame. Selected acting clips, featuring scenes from BLOOD TRAIL: THE TRAIL HOME, ER, STAR TREK: VOYAGER, and HIGHLANDER: THE SERIES. Clips are used for professional demonstration only. In 2017 he filmed three diverse sword and fight projects as well as trained pro performers from Australia, India and Finland at Rancho Indalo in a variety of weapons and fight skills. He celebrated the 30th Anniversary of MASTERS OF THE UNIVERSE at Power Con. He created the role of Blade the Double Swordsman, trained and choreographed Dolph Lundgren and doubled Frank Langella. It was a fun and busy shoot. In 2018 he will be celebrating all things Highlander at Highlander World Wide Con. He guest starred twice on the series on “Blackmail” in season 3 and “Duende” in season 5 where he introduced the Spanish style of rapier fighting on the Mysterious Circle to film for the first time. In both instances he had the great pleasure to co-choreograph the fights with his pal F Braun McAsh. Here’s a pic of them guest starring on MythQuest playing Lancelot and Maleager in Calgary. Again they created the action together and this time got to perform as partners as well. Both Braun and he will be teaching Master classes in whip, knife, double weapons and are looking forward to their examination of Japanese Katana vs German Longsword. After a long day training. When Anthony De Longis chooses to exclusively ride in Aussie Saddles, you know he knows the best .... and that is Colin Dangaard's saddles !!! !